Preheat the oven to 400 degrees. Heat a heavy skillet over medium heat, add half the oil, and when it is hot, add the onions. Saute them, stirring occasionally, until they are nicely browned, about 10 minutes. Add the garlic and stir it in for about 30 seconds, then remove the pan from the heat and stir in the vinegar. Meanwhile, toast the bread until it is well toasted, and let it cool on a cutting board. Chop it into very small cubes, and combine it in a bowl with the cheese, Italian seasoning, and remaining oil. Put the mushrooms stem side up on a baking sheet lined with a silicone mat or sprayed lightly with cooking spray. Divide the onion mixture evenly between the mushrooms, then top it evenly with the bread crumb mixture, even if it is spilling out a bit. 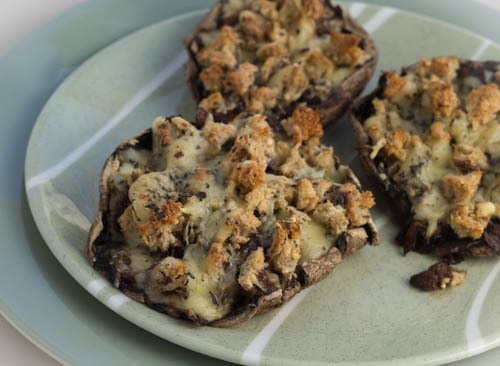 Season them with the salt, and bake them for 15 – 20 minutes until the filling is nicely browned on top and the mushrooms are very tender. Serve immediately or refrigerate them for up to 3 days. Serve it with roasted Brussels sprouts and fried eggs. Thanks for sharing my recipe–LOVE manchego cheese. This recipe is so good. I served it to my daughter who said, we should have it again… really soon!